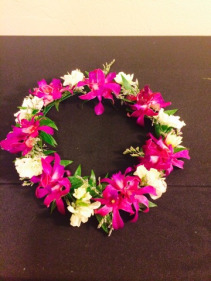 This flower crown features mini orchids, white stock and greenery, sure to accent any hairstyle! Call the shop today to order and customize at (208)323-7738! **This piece features items that may not be available at time of order. Please call for details. 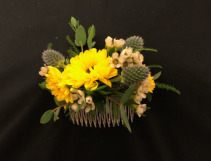 This adorably wild hair comb features viking mums, gunni eucalyptus, white waxflower and eryngium. The flowers in this picture may not be available at time of ordering, but we can always do something customized and similar! Call us at (208)323-7738 to order! 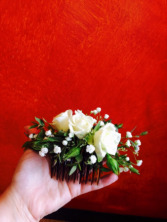 This modern twist on hair flowers will accent your attire; perfect for those who want an elegant twist to a wrist or pin on corsage. Call the shop to order and customize at (208)323-7738. 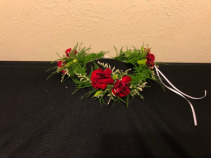 This floral crown features soft greenery with burgundy carnations, white limonium filler accent and an adjustable ribbon tie (it can also be made solid to sit on the back of the head, without a ribbon tie). Call the shop at (208)323-7738 for more details on customizing your order and price differences. 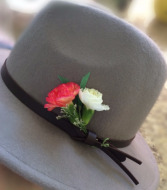 **This is a custom product and will be made to order with head measurements. Please provide measurements at time of purchase. HEAVENESSENCE FLORAL & GIFTS can create the perfect hairpiece or hand held bouquet to enhance your prom night experience. Using flowers, we can match your prom style and colors. So remember, if you're looking for prom accessories in Boise, HEAVENESSENCE FLORAL & GIFTS is the place to be!